Feldschlösschen Getränke AG in Rheinfelden is an importer of Corona beer for the Swiss market. The Mexican producer delivers the goods in containers and without pallets. This is where RollerForks® show their strength. The 40 foot container can hold 25 palletless stacks each comprising 63 boxes with 24 bottles of beer. That is a total of 37,800 bottles or 25 tonnes per container. Feldschlösschen imports Corona beer from Mexico. A container with beer can be unloaded in twenty minutes using RollerForks®. Previously goods had to be unloaded manually and placed on pallets by five men working one and a half hours. The lorry driver can now wait on site for the lorry to be unloaded at lightning speed. 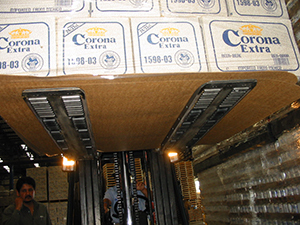 The goods are shipped by Corona worldwide on slip sheets. These act as pallets; the RollerForks can slip underneath and lift them. The forklift then places the stacks on normal pallets. These are then stacked by other vehicles with standard forks. Palletless handling is simple with these special patent forks. Each fork has rollers on two levels. When the lower rollers touch the ground, the upper rollers turn in the opposite direction so the fork slides under the merchandise. These special forks can be fitted to all forklifts with FEM fork carriages. 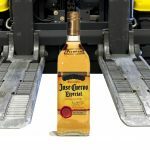 Since neither hydraulic systems nor lubricants are needed, the RollerForks are particularly suitable for transporting foodstuffs, chemicals, consumer goods, drinks and pharmaceuticals. Other advantages: the unladen weight is almost identical with that of standard forks. This means that forklifts with higher residual capacity are not required. After unloading the container the same RollerForks can easily be used like standard forks for its more usual tasks. Investment costs are low. If you calculate the time saved, a RollerFork will pay for itself in a very short period. It is also possible to place a load with a slip sheet on a standard pallet for internal transport. Before purchasing RollerForks for testing or utilisation, their purpose and objectives must be analysed thoroughly. Your own logistics processes need to be reassessed. Factors are size and type of packaging (maximum weight 3000 kg) and the slip sheets used. If you want to buy RollerForks for trial purposes after an analysis, trained personnel should be on site when you use them. At Feldschlösschen the Corona beer stacks are unloaded from the container by RollerForks in a record time of 20 minutes. Source and photo on top www.materialhandling.ch Mr. Feurstein.